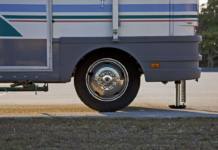 Do you know what to do if your RV or tow vehicle blows a front tire? Slam on your brakes? No, don’t do that or you’ll risk going out of control, being badly injured or off to your next life. This video from Michelin shows you what to do in such a situation, and why to do it that way. Watch it. Then watch it again. And then tell your friends and family to watch it. At RVtravel.com we carefully monitor all news about RVs and RVing, and hardly a month passes that there isn’t a serious or even deadly crash that was caused by an RV tire blowout. Such an event can be a catastrophe or it can be a minor inconvenience — depending to a large degree on how the driver reacts. Tire brand confusion: Who makes which RV tires and where? Would this work in a travel trailer as well?